Customer satisfaction is our number one priority. We put our customers first and work with a sense of urgency to address their concerns from start to finish. We regret to hear your concerns, and assure you that this is not the experience that we wish for our customers. We’ll be following up with you shortly to discuss a resolution. 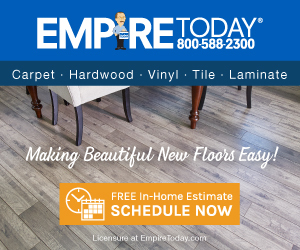 My dispute is with Empire today flooring! I've been a loyal customer for over 20 yrs they've probably laid like 7 floors through the years for me but no more!! In Sept I had my kitchen and living rm done they damaged over $2000 to my cabinets , damaged molding changed the layout without asking me. It's been a nightmare I have before pictures taken 2 days before (someone told me to take pictures of my wood floor underneath if every I was to sell my house I'm very grateful to her). I've disputed with Chase( and got nowhere) and they also sold me not what I asked for. I have pictures witnesses etc.. I can't believe how I've been treated. My husband works 6 days a week we have also recently found out we were very overcharged. We are good people my husband an ex volunteer fire chief / first responder / Sgt. in the Marine core!! We NEED someone to help us . I called BBB they said they have over 2,600 complaints but with such a huge company I'm just a bleep! Please make this nightmare ( there's so much more to this story) prevent this from happening to someone else!! Please help us. Thank you! There are more pictures! Review #1453672 is a subjective opinion of PossessiveFlatCoatRetriever. Hard to belive they are still in business. And there commericals are really getting old 588-2300 EMPIRE! I can remember that all the way back when I was Junior High School. BBB is not what the general public seems to think. It is a no-power do-nothing gripe board who charges businesses for membership and a door sticker. They are not the Protector of the People or The Commerce Police and have no representative or remunerative authority. An "urban legend" best describes them. Thousands of complaints to someone with real teeth in their mouth would be headline news.